Today I’m excited to be joining a group of over 30 other talented bloggers who are also sharing a Fall Mantel or Vignette with you! A special thanks to my friend Krista at The Happy Housie for hosting this tour and getting us all together. 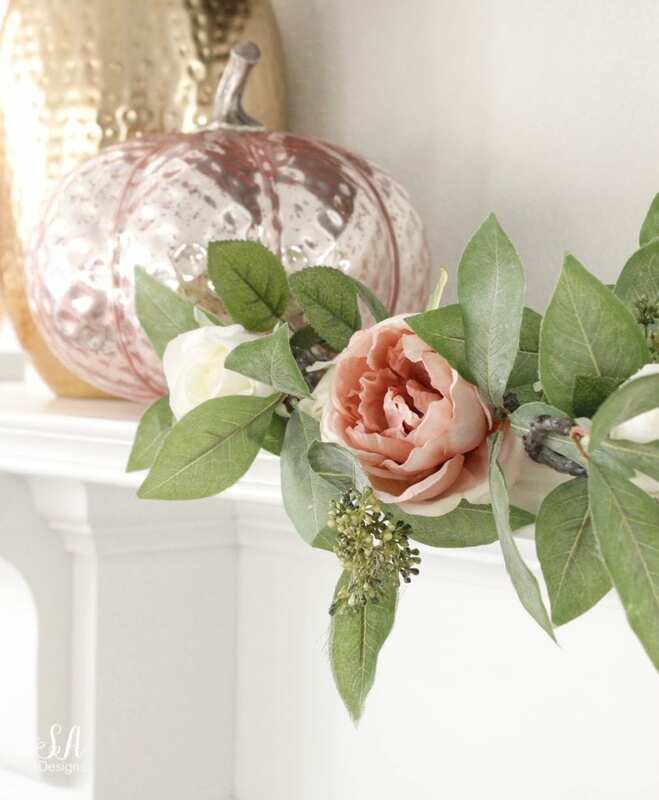 I created a blush pink glam fall mantel for the season and can’t wait to share it with you! Our television hangs over our living room fireplace. I didn’t thing I’d want that again, as I’ve had in a previous home, but as it turns out…it’s been perfect. However, when it comes to decorating a mantel for the changing seasons, it can sometimes be tricky and make my options different than if I’d had a beautiful large mirror instead. No worries, though. I’ve found a way to decorate around it. 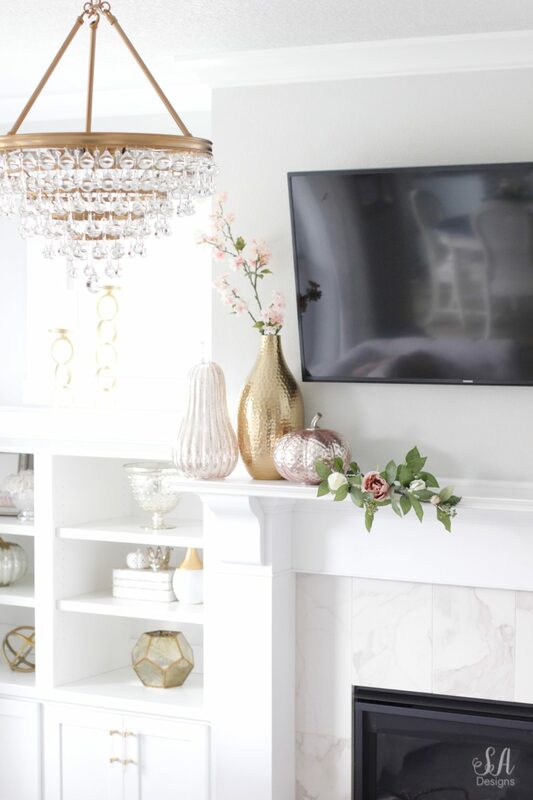 On the left side of the television, I kept a tall brass vase for height and also because I wanted to incorporate some gold tones with the blush tones. I’ve found some beautiful blush glass pumpkins (as well as gold and silver pumpkins) over the years. I grabbed a couple of them and added them to my mantel. I placed a faux green leaf stem as a swag, coming from one pumpkin. 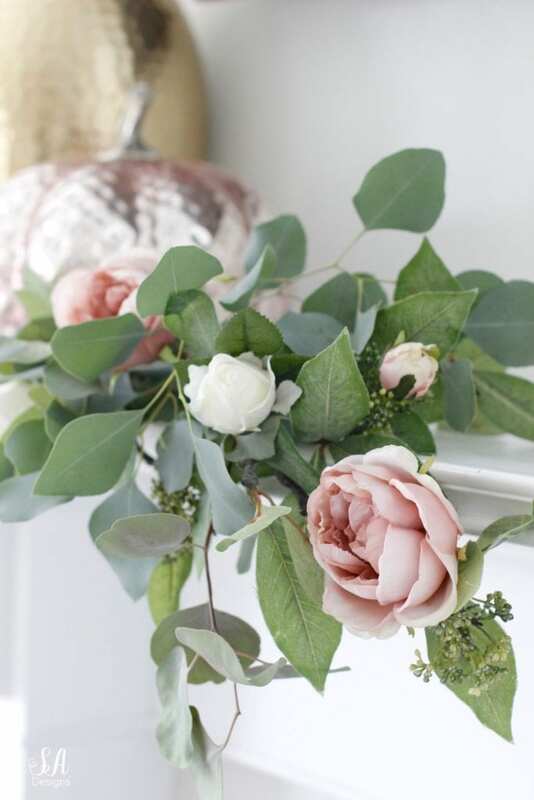 I happened to have some live eucalyptus from last week’s floral arrangement and thought it would be pretty to mix them into the faux greenery swag and then add some faux white and blush rose stems. I decided to grab 2 of the 3 candle holders with the DIY Fall Glam Candle Wreaths that I made a couple of weeks ago and shared with all of you. I left one of them on my buffet with something else. I’ll update you on that later. 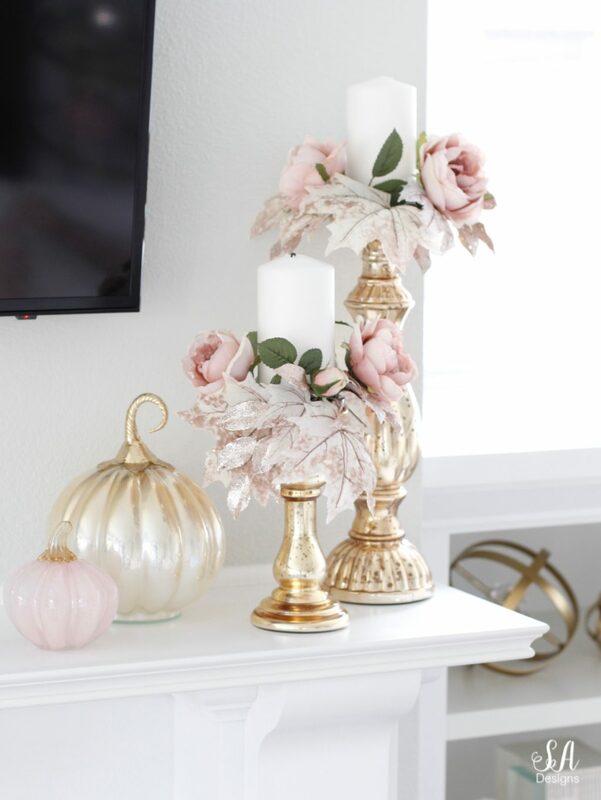 Adding a couple of more pretty glass pumpkins gave this mantel even more of a glamorous feel. I liked the idea of just decorating from the ends of the mantel and not going all the way across. 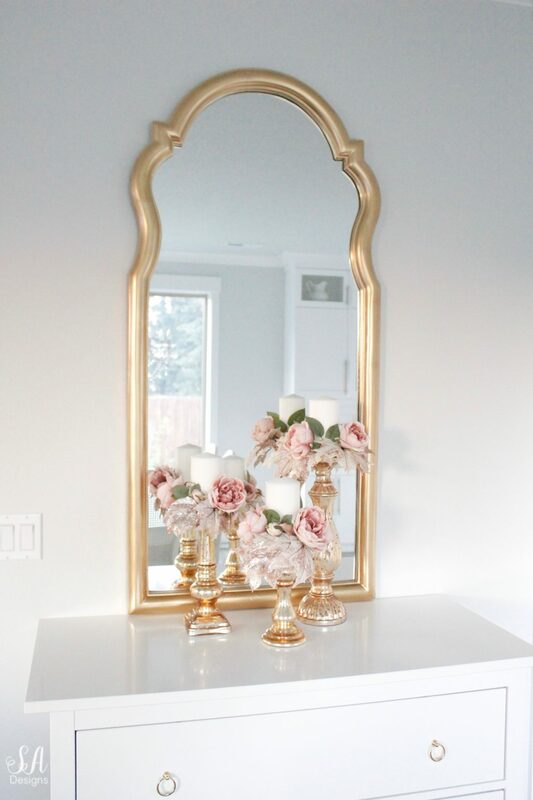 I want to save the heavier decorating of the mantel for Christmas and keep this lighter but festive for fall and just the perfect touch of blush and glam! What do you think? Summer this is so pretty and elegant. 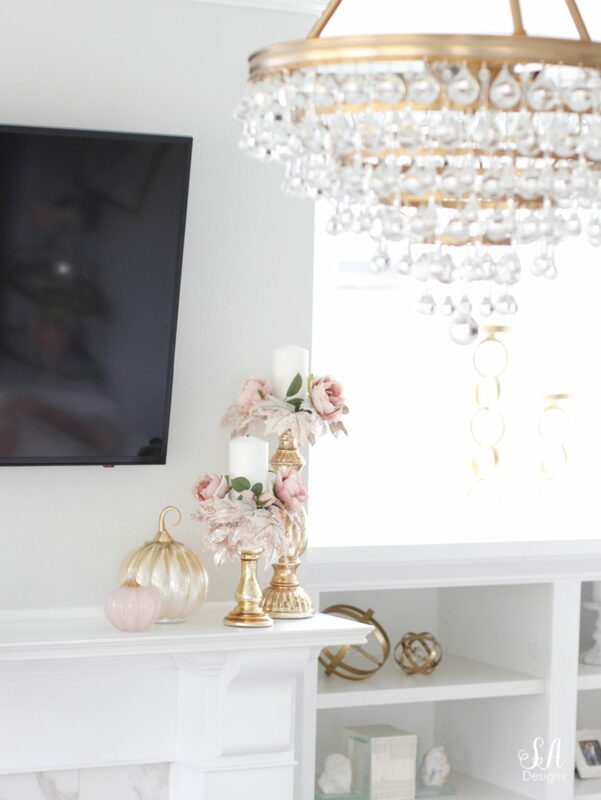 Love the soft touches of blush and gold. 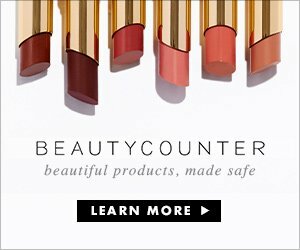 Love that you did pink for fall! 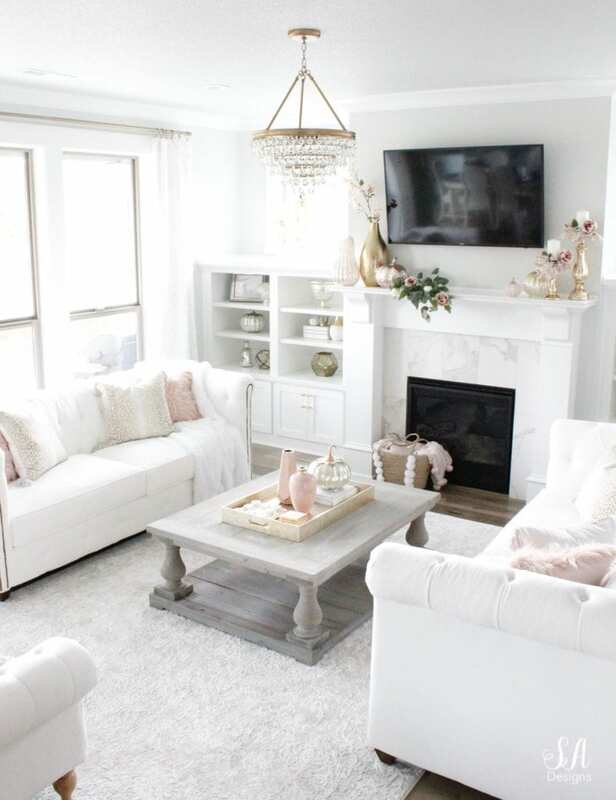 Your mantel and living room are gorgeous as always, Summer! Thank you so much for sharing your beautiful ideas! 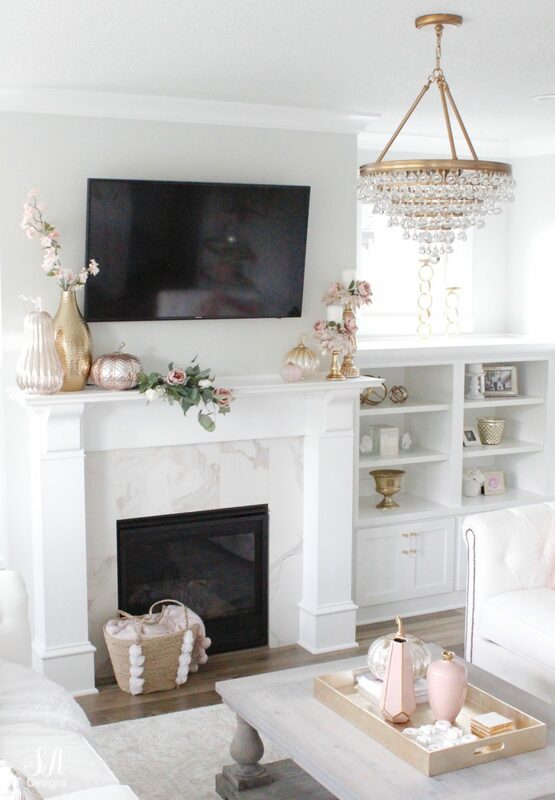 Summer, I absolutely love your mantel with all of the beautiful pinks. Such a fresh and elegant take on fall! So happy to be doing this tour with you!! Oh, the pink and gold are so pretty together – a softer side of fall. Beautiful! Your mantel decor is sooo pretty, Summer! Just like you 😉 I love pink & green together. Definitely a very glamourous mantel design! Thanks for taking part in this hop Summer. So pretty… I am obsessed with pink this year. Off to Pier one tomorrow… luv the pink pumpkin. 🌸linda of no.cal.